The Sparks slot has its pros and it has its cons. Sparks is a mixed bag of a slot. Some players will love it, and others, quite simply won’t. Whether you feel that Sparks has missed the mark or not, depends on what you seek in a slot game. Sparks is one of the latest video slots to be released by Net Entertainment. 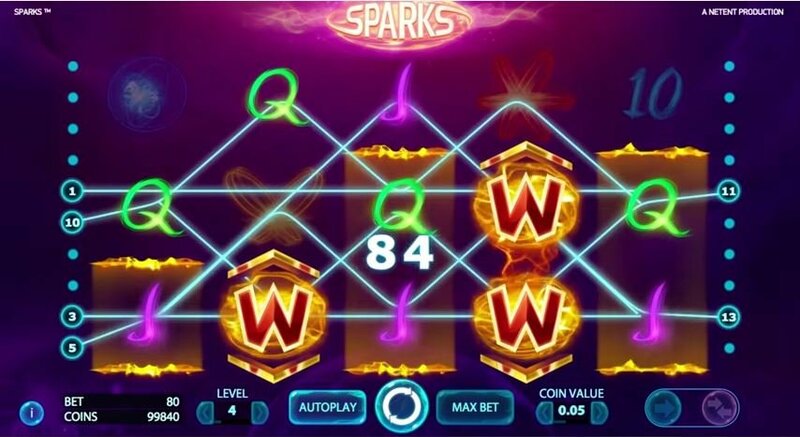 The Sparks slot machine was released in late July 2015, and is energy themed. High playing cards, gaseous elements, and atomic symbols, all spread their way across the 5 reels and 20 paylines of this all action slot, to help you win an energetic non-progressive jackpot. 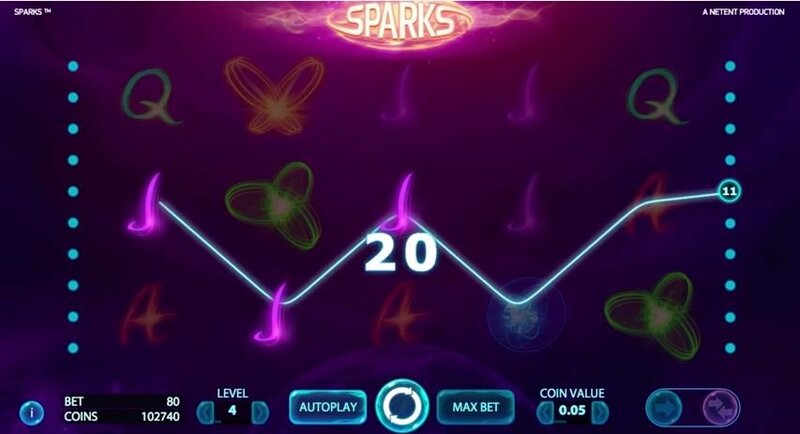 Now, let’s see what else Sparks has got to offer, in our Sparks slot review. The Sparks slot graphics are all very well designed. In some way, shape, or form, they are all designed to depict sources of energy, such as gas and electrical charges. It is certainly an original theme, and one which may earn Net Entertainment some credit. Those energy-based symbols are joined on the reels by lesser-paying, high-playing card icons, which are also gaseous in appearance. NetEnt have a habit of not permitting players to adjust the number of paylines in their latest slots. That is also the case in the Sparks slot game. All 20 paylines are fixed into place, although players will be able to alter the value of their coins, and the number of coins they bet per line. You’re looking at paying just 20p a pop for a spin on the Sparks slot machine. 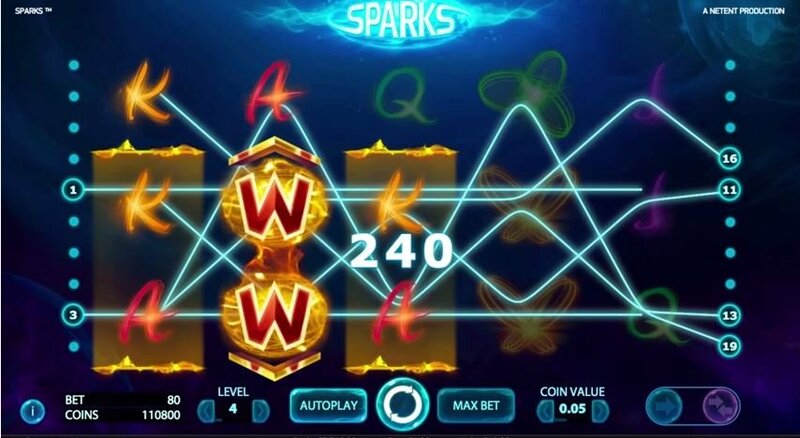 A total of two wild features are present in the Sparks video slot. The first is a basic wild icon. It can replace all other symbols in the game, with ones you will need to win a payline. The one symbol it cannot replace, though, is the Cloning Wild icon. This second wild symbol is the main attraction when it comes to Sparks slot bonuses. When this symbol appears on the reels, it can expand to cover an entire reel. Symbols located adjacent to this special wild will then be cloned, resulting in larger wins for the player. There isn’t really a bonus round included in Sparks. However, the Sparks slot most certainly has a bonus feature. The feature is the ability to win both ways. During the base game, the player will only be able to win in the customary left to right fashion. However, when the Cloning Wild symbols appear, you have the option of winning from right to left, as well as the standard left to right. This is a nifty little feature, and although it isn’t exactly a good substitute for a free spins bonus, it isn’t exactly a bad one, either. The Sparks slot has its pros and it has its cons. In many areas, such as theme and the Cloning Wilds, Sparks is incredibly original. That is always going to appeal to a large section of the online slot playing crowd. On the other hand, it lacks a free spins bonus, and doesn’t really offer you any multiplier wins, such as those typically offered via scatters. Sparks is a mixed bag of a slot. Some players will love it, and others, quite simply won’t. Whether you feel that Sparks has missed the mark or not, depends on what you seek in a slot game.